An orchestra is a great example of a high-performing team. How well are your employees playing together? How well are your employees playing together? Are they playing in harmony or are they slightly out of tune? I am an amateur musician (flute, piano and bassoon) and have performed with numerous orchestras and groups. Currently I am the principal bassoonist for the Broomfield Symphony Orchestra. The BSO has more than 60 regular members, most are amateurs like myself. Individuals who have a passion for music. A group that comes together once a week to rehearse and performs five concerts a year. We spend, on average seven weeks rehearsing for each concert. Not a lot of time to ensure 60 people are perfectly aligned through every piece of music. What does this have to do with technology? Well, nothing. However it has everything to do with technology teams. 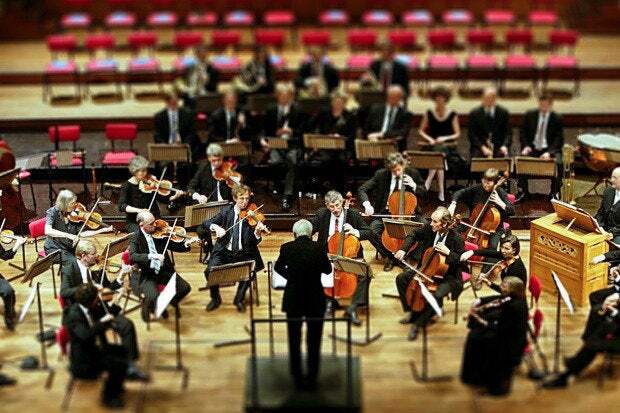 An orchestra is a great example of a high-performing team. Any musical performance comes alive when everyone is playing in harmony, yet it only takes one person to be off-key and out of tune for the performance to be marred. Here are the high-performing-team lessons that I have learned from more than 30 years of playing music and performing with symphony orchestras in Europe and America. 1. Focus. Orchestra members are provided with all the information they need to perform in a concert, including the music, the order in which we will be performing each piece, and the date and time for every rehearsal and performance. We have a clear focus on what needs to be achieved. In addition, we each receive a personal road map to help us get from the beginning to end of each piece of music that we perform. Our individual parts show us when to play (speak up), when to be quiet (listen), when to move quickly (allegro) and when to slow down (largo). High-Performing Team Action: How aligned are your team members in what results need to be delivered. Test them by asking them to list the top three priorities for your group for the remainder of the year. Do you end up with a list of the critical few items (focused) or is it more like 50 items where everything is a priority (unfocused)? Is everyone clear and aligned regarding the purpose and goals of the team? What might the team need to stop doing to ensure success? 2. Roles and Responsibilities. The orchestra has clearly defined roles and responsibilities and ensures that each one is filled appropriately. You can’t have an effective performance if a role is not filled; the performance would be rather flat if there were no cello section or the flutes were missing. As principal bassoonist I will receive and play my music. I don’t try to play the trumpet part, and the second bassoon plays their part. Can I step in as needed to support the second bassoon or vice versa? Of course – but ultimately we can only play one part, our part, at a time. High-Performing Team Action: Ensure your team members understand their individual roles and responsibilities as well as the collective skills of the team. Identify any potential gaps and decide how these might be addressed. Sharing career histories, past roles and experiences will allow everyone to identify the talents in the team and better understand how and when to tap into these. Do you have the right combination of roles, knowledge, skills, ability and experience on the team? Is everyone playing in their best role to the best of their ability? 3. Learning and Practice. The weekly rehearsals are only part of the equation. They allow us to practice together, listening to the other sections and instruments to increase our understanding of where and how our individual parts fit in. However there is also the individual rehearsal time we all do to ensure we can perform our piece to the best of our ability. Yes, occasionally we will try to "wing it" and sight-read our part. However, nothing is better than practice, and nothing beats the guided practice in a group rehearsal. What’s working well or getting in the way of our success (individually and collectively)? What can we do (individually and collectively) to move this team to the next level? 4. Relationships. I would be remiss if I didn’t mention the importance of relationships to an orchestra’s success. Even when accompanying a solo performer, it is the relationships within the orchestra (and between the orchestra and the soloist) that ensure collective success: listening to each other, adjusting our individual volume and dynamics, the give and take that ensures a performance that the audience enjoys. High-Performing Team Action: Building effective relationships at work is the key to individual and team success. It means going beyond the transactional – simply doing your job – and means you have to pay attention to the transformational aspects, the interpersonal dynamics that bring people together. What are the rules of engagement for how we will work together? How do we ensure the right level of candor and debate? 5. Celebrate Success. The conductor shares the success of the performance. Once they have taken an initial bow, they turn and invite the orchestra to stand and share the spotlight. They shake hands with the leader of the orchestra and the soloist. The team celebrates the accolades together. High-Performing Team Action: How does your team celebrate success? When did they last acknowledge their colleagues and say "thank you" for their contributions? What are the key milestones and measures of success we should celebrate? How will we recognize and applaud individual and team success? Whether you are considering your team at work, or a social group that you are part of, I hope that these five lessons and 10 questions help you build your high-performing team. Morag Barrett is a sought-out speaker, CEO of SkyeTeam and the author of Cultivate: The Power of Winning Relationships and The Future-Proof Workplace.